This is my first Christmas with my employer and one of the traditions is having a secret Santa. As a papercrafting junkie, I LOVE creating fun daily treats. Early on, I was trying to figure out a way to stump my person. My coworkers know of my love for papercrafting and me being Santa wouldn't be secret for long! When one colleague told me she hoped I had her name for secret Santa, I had a thought. If I can't keep my Santa identity a surprise, I can at least surprise some other folks. There are 21 people participating. I decided to make multiples of most of my projects, give one to my person and choose 2-4 others to receive the treat as well. Between now and Christmas, I'll share some of my projects with you. I was so surprised to see that the Square Pillow Box die is retiring. I thought for sure this would be a keeper. 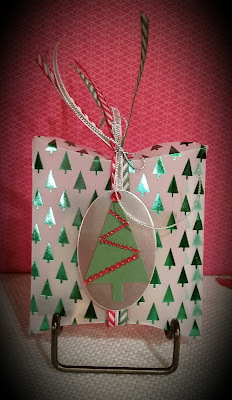 The box in the photo is made using the Holiday Fancy Foil Designer Vellum. This is beautiful paper. 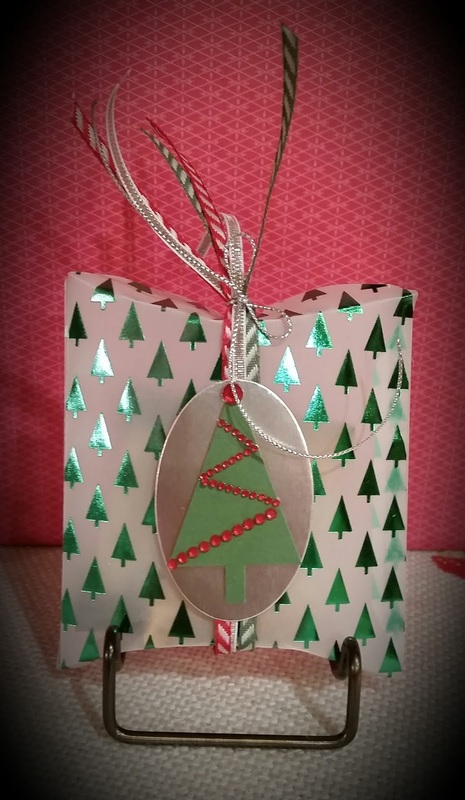 Products I used for embellishing include the Tree punch, oval framelits, silver foil sheet, rhinestones, 1/8" striped ribbon from the Holiday catalog and 1/8" Silver ribbon. There are two Ghiradelli chocolates inside the box - yum! I sure hope the treat is enjoyed! Don't forget to check out the great year end deals! Click here to shop. Stop back for more photos of my Secret Santa projects. What kind of treat would you like to receive in a secret Santa package? Please share in the comment section. I love to hear from you.